Khader Adnan is a 33-year-old Palestinian graduate student, who, until he was arrested by Israeli police on December 17, 2011, lived in the occupied West Bank with his wife and two young daughters. Their home is in the village of Arrabe, near Jenin. Adnan has not been charged with any crime. Instead, he has been placed under administrative detention, the set of laws that are hideous holdovers from the British Mandate era. Israel uses administrative detention to arrest and hold Palestinians for any purpose. Eight weeks after his initial arrest, Adnan has still not been charged. The day after his arrest, Adnan began a hunger strike to protest the administrative detention laws under which he was placed, literally, in chains. Eight weeks later, he continues his hunger strike and by so doing has become a hero to Palestinians who know the power and brutality the laws inflict on persons under total control of the Israeli Occupation Authorities (IOA). Khader Adnan has quickly become the focal point and symbolic face of the inherent injustice thousands of Palestinians face on a daily basis within the Israeli penal system. Entering into the 56th day of his hunger strike, Adnan is protesting the Israeli Occupation Authority’s (IOA) illegal application of administrative detention and its inhumane treatment of Palestinian detainees. Under detention, Israel may hold a prisoner for up to six months without revealing any evidence against him or her. Israeli NGO Physicians for Human Rights-Israel (PHR-I) considers indefinite detention without charge, to be a form of psychological torture. According to B’Tselem spokesperson Sarit Michaeli, the number of Israel’s administrative detainees is on the rise. In January 2011, Israel held 219 Palestinians in administrative arrest; by December, 2011, that number rose to 307. Khader Adnan has appealed his current four-month administrative detention order. On February 9, an Israeli court held a day-long special appeal session for Adnan at Zeif medical center. The Israeli military appeals Judge Moshe Tirosh concluded that she was unable to reach a decision on Adnan’s appeal. Addameer’s report indicates that Khader Adnan has not been allowed to shower, or change his clothes or underwear since his arrest. On February 7, Adnan’s wife, Randa, and his two young daughters were given permission to visit him for the first time. This weekend, Adnan will have been on his hunger strike for eight weeks. His health is now considered to have reached a seriously dangerous stage. Physicians for Human Rights-Israel (PHR-I) denounced the fact that the Mayanei HaYeshua Medical Centerm has allowed Adnan to be hospitalized in chains, noting that in doing so the hospital is in violation of medical ethics, as well as the instructions of the Israeli Health Ministry and Israeli physicians organizations. Mayanei HaYeshua Medical Center was founded in Bnei Brak in 1990 by Dr. Moshe Rothschild, as a public/private hospital, in order to provide advanced medical services in the spirit of Halacha (Jewish religious law). For Dr. Rothschild, a man rich in public service, the Medical Center was his life’s crowning achievement – a modern hospital meeting the highest standards of medicine and technology, and run, down to the smallest details, according to the most meticulous dictates of Halacha, which would provide a warm home for patients in many and varied fields. In a letter Khader Adnan wrote this weekend from Zeiv Hospital, where he is now receiving treatment, Adnan vowed to continue with his strike. His letter, delivered by Jalal Abu Wasil, a lawyer from the Palestinian Ministry of Prisoner Affairs, who visited him in hospital, added that Adnan refused to be examined by doctors. I hereby assert that I am confronting the occupiers not for my own sake as an individual, but for the sake of thousands of prisoners who are being deprived of their simplest human rights while the world and international community look on. Administrative detention as an Israeli policy is the target of Adnan’s hunger strike. Young people (see picture at top) gather in Ramallah to protest Adnan’s detention. 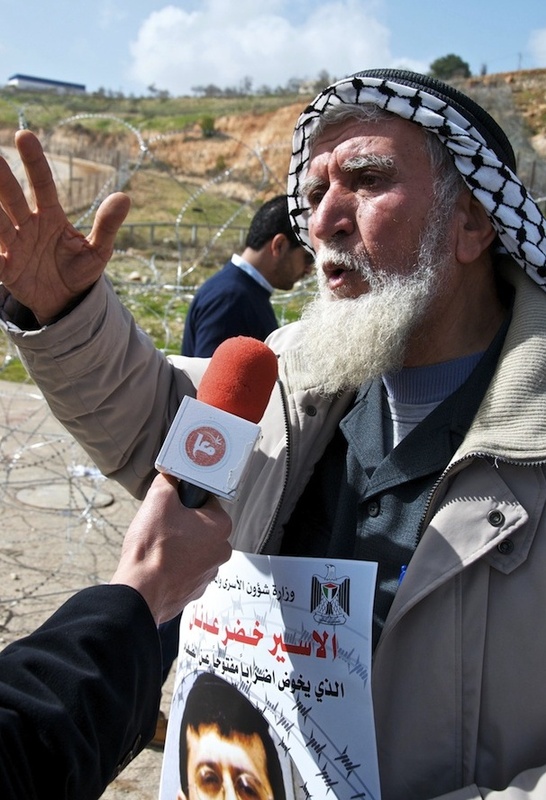 Musa Adnan, Khader’s father, had joined his son in the hunger strike. Musa Adnan is pictured at right, talking with a reporter. On Friday, the Palestinian Authority’s prisoners affairs minister Issa Qaraqe told Ma’an News that Egypt was “intervening with Israel to free Khader Adnan”. He added that the Palestinian leadership of Mahmoud Abbas and Salam Fayyad have made calls to several countries asking for their assistance in calling for Adnan’s release. These detainees warned in a letter to the general director of Israel’s prisons, that the situation may escalate if anything happens with Adnan. They also demanded his release, adding that the prison administration and the Israeli government would be held responsible for his fate. A court ruling on Adnan could be released on Sunday. Meanwhile, Israeli authorities have refused to allow Qaraqe and Adnan’s family members “to check up on his health”. There is no indication that any appeals have been made to, or have come from, US authorities. The picture at the top, taken in Jenin, is by AP photographer Mohammed Ballas. 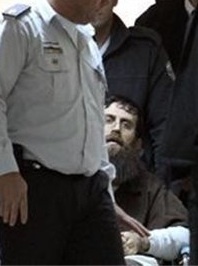 The picture of Khader Adnan was published February 11, 2012, on The Ma’an News Agency web site. The Agency does not indicate the date on which the picture was taken. The picture of Musa Adnan is by Dylan Collins. It is from the Palestine Monitor. This entry was posted in Middle East, Middle East Politics, Religious Faith and tagged human rights israel, indefinite detention without charge, israeli occupation authorities, occupied west bank, palestinian detainees, physicians for human rights. Bookmark the permalink. Thank you, Jim, for making us more aware of KHADER ADNAN. No doubt, he is an honorable Palestinian hero. If his religion was Judaism, the whole world would have gone out of its way to call for justice. No day would have gone by without a mention in the Presidential election campaign. But, he is only a Palestinian. He is sub-human because he dares resist one of the worst tyrannical regimes and Apartheid systems in the last century. It seems to me that Israel is so widely engaged in such an extensive array of heinous human rights abuses that they hope to make life miserable for Palestinians, in order for them to pack up and leave. Let the Herodean Zionist Apartheid nuclear expansionist regime know that its detestible crimes against humanity will one day catch up with it and will bring it tumbling down with a fate not dissimilar to that of King Herod himself. 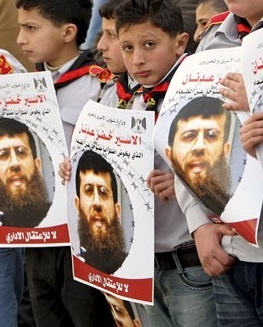 If Khader Adnan dies during his hunger strike it will be another sad day for the cause of justice and freedom. Israel’s current government, catering as it does to the illegal settlers in the Palestinian Occupied Territories, and to other extremist movements in Israel, is rapidly losing what is left of its credibility in the world. Even those who defend Israel right or wrong know in their hearts that Prime Minister Netanyahu is digging a pit for the nation they support. Israel cannot survive indefinitely without a “two state solution.” But Mr. Netanyahu is doing all he can to destroy that option. His is a misdirected policy that is not only destructive of Prophetic Judaism but of the cause of freedom for both Jews and Palestinians. The cruelty being done to this man is shameful, and the billions of dollars the US gives to Israel, that oppresses people with such brutality every single day because they are not Jewish, is even more of an abomination. Our support for Israel makes our nation complicit in their crimes. The Egyptian intervention is very welcome – Israel cannot afford to alienate itself from Egypt. The failure of the US to speak out is, sadly, not surprising. What other aspect of Israeli policy have we criticized, beyond the meaningless rap over the knuckles about settlements? We, and they, will pay a huge price for this. Thank you Jim for highlighting this issue of a grave injustice which has been going on for decades and will go on endlessly as long as the international community and especially the US continue to allow Israel to get away with all those violations of human rights. We have seen the US wage wars in defense of human rights, but it seems Israel is above any law. The occupation is a continuing inhuman brutality, and the United States that claims to be a natiion of freedom, democracy and peace, is basically responsible. May God have mercy upon us.